A new adaptation of the colonel’s story by Verónica Triana and Jorge Ali Triana, commissioned by Manhattan’s Repertorio Español, is scrupulously faithful to García Márquez’s original. Rotating with performances of other Spanish language dramas, this production fills the tiny proscenium of the company’s historic playhouse to capacity with eight actors, picturesquely cluttered sets by scenic designer Raul Abrego (lighted with appropriate dreariness by Manuel Da Silva), and Jimmy Tanaka’s rousing incidental music. This is a drama in which the principal characters are largely inactive and very little happens. The colonel meets the mail boat, as he has done regularly for 15 years, anticipating word that retirement funds are on their way. “I have a feeling that today the letter will arrive,” he declares, though without any objective basis for such optimism. When the contents of the mail bag are distributed, the colonel is turned away empty-handed again. Finally, circumstances are so dire that the couple sees no choice but to sell the rooster, which means losing the prospect of the victor’s purse in the upcoming competition (as well as relinquishing their last physical tie to the dead son). Zulema Clares as the Colonel's wife (holding Horatius) and Germán Jaramillo as the Colonel in the Repertorio Español production of No One Writes to the Colonel. Top, from let: Paul Montoya as Alfonso, Txemi Parra as Alvaro, Jaramillo and Erick González as Germán. Photographs by Michael Palma Mir. Under Mr. Triana’s direction, the fine cast manages to animate Gárcia Márquez’s absurdist tale with a sense of psychological momentum and narrative urgency. Jaramillo is believably bewildered as the unworldly colonel, at odds with a culture that stresses religious observance but disregards the ethics of the Gospels. As the wife, encumbered by illness, age, and the frustration of her husband’s inaction, Clares is at once strident and sympathetic. 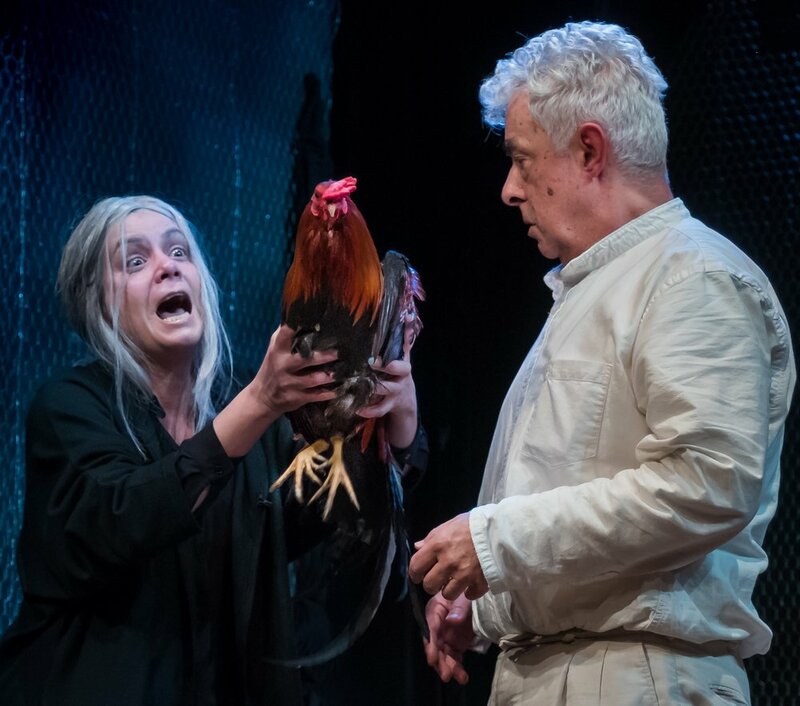 At the play’s end, these two characters are no better off than at the beginning; yet the actors convince us that they’ve developed an understanding—or perhaps merely tolerance—of the world’s inexplicability that they previously lacked. Gárcia Márquez is known as the master of magical realism; but he wrote the colonel’s story before developing that aspect of his authorial perspective. No One Writes to the Colonel, like Waiting for Godot, mines the humor in what’s arbitrary and irksome. Whether Gárcia Márquez was familiar with Beckett when he created No One Writes to the Colonel is anyone’s guess; but records indicate he was writing that novella at the very time Atkinson published his review of the Irish writer’s existentialist masterpiece. Before and after the performance reviewed here, in a space that’s more vestibule than lobby, Spanish-speaking playgoers displayed a degree of amity uncharacteristic of other Manhattan theaters (even small, not-for-profit companies). Spectators greeted regular members of the troupe—e specially Clares and the endearing Luis Carlos de la Lombana, who plays the village doctor—with lusty cheers when they first entered and during the curtain calls. At Repertorio Español, now celebrating its golden anniversary, the audience evidently knows what to expect and treasures what it finds in a theater that’s one of the architectural gems of the Flatiron District. No One Writes to the Colonel plays in repertory with 15 other works at Repertorio Español (138 E. 27th St., between Lexington and Third avenues). Simultaneous English translation of Spanish-language performance is accessible to playgoers on small screens at each seat in the auditorium. Performance schedule varies week by week; upcoming performances include April 12, 22, May 4, 12, June 5, July 1, 7, 13, Aug. 2, 11, 19, 24, with more to be announced through 2018 and 2019. For tickets and information, call (212) 225-9999 or visit repertorio.nyc.